Now, to those who are Musically-Inclined, listen up! Everyone loves music, but not everyone owns an instrument or a vast record collection. 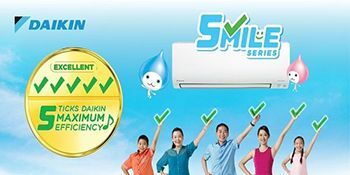 Then there are those who live and breathe music, either as professionals who make a career out of song and dance, or dedicated amateurs who fill their homes with CDs, posters, vinyl records and instruments. 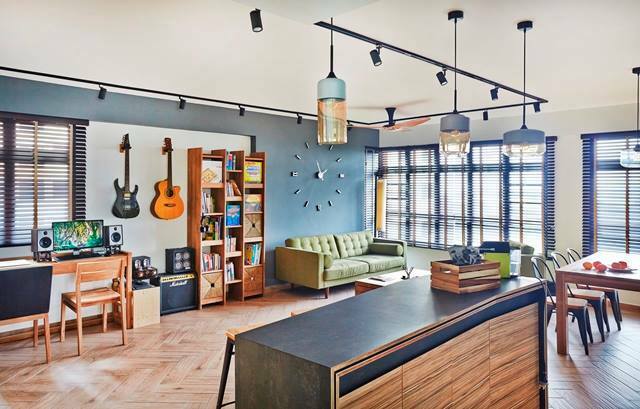 In this post we've compiled some of the most beautiful and creative ideas for all things music-related, looking at everything from where to store your instruments, decorative layouts, and even entire rooms devoted to jam sessions. 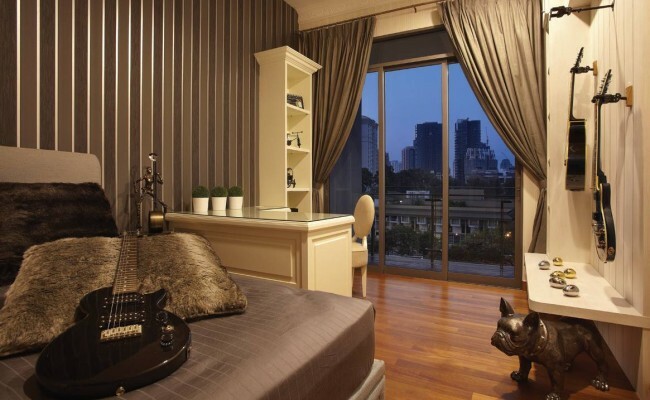 This room combines classic elegance with modern rebelliousness. While the silk bed-sheets, plush pillows, and dark palette all underscore the owner's refined taste, those three guitars hint at the spirit of rebellion. A perfect fusion of sophisticated and spirited, this interior uses musical instruments to lend a rough-edge to an otherwise smooth look. Unlike the previous example where music was one of the room's defining factors, this home opts for a different approach. Here, the instruments are used more as decorative items, and while their roles are secondary, they still manage to convey the owner's love of music. After all, given the blank walls and an almost complete absence of ornaments, those two guitars draw our gaze without much effort. 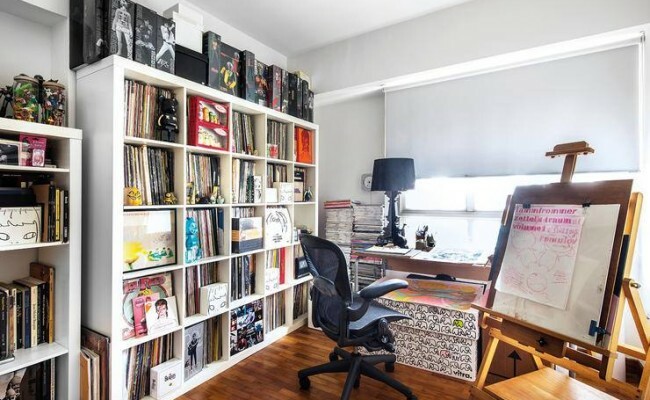 At first glance we can tell this is the room of a music-enthusiast rather than a professional. 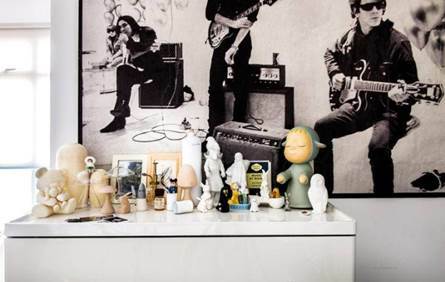 From the Velvet Underground poster to the large case stuffed full of albums and records, the messy look just adds to the overall cool attitude. The whole point of rock music is to be creative and free, so a little untidiness goes a long way to achieving that special quality. Even if they're never used instruments bring a wonderful artistic touch to any home. Being placed next to a bookcase, computer and large wall-clock, and surrounded by such unique light-fixtures and multiple shades of blue, these two guitars may not stand out and dominate their environment, but they do add a welcome layer to the general eclectic vibe of the room. For the truly devoted there's this little number from Starry Homestead. 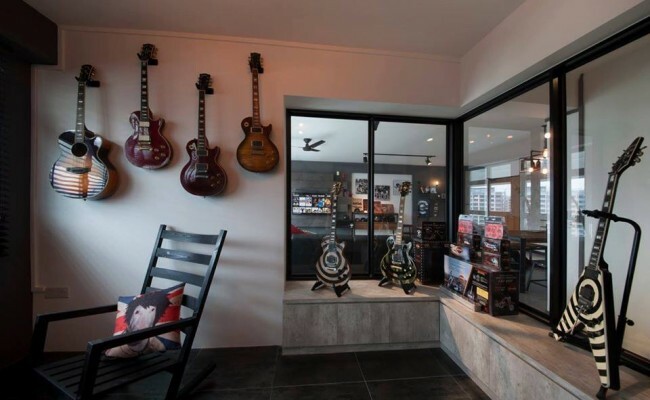 A shrine to music, what makes this room so appealing is the clean layout (which is somewhat contrary to rock's free-spirited attitude), its collection of beautiful acoustic and electric guitars (the former of which are mounted asymmetrically on the wall for stronger visual effect), and the large transparent windows that proudly show off this brilliant collection. This room is both a shrine and a sanctuary, a place where those passionate about music can go and sit on the rocking chair, listening to their favorite tunes on an iPod or playing them on a guitar. 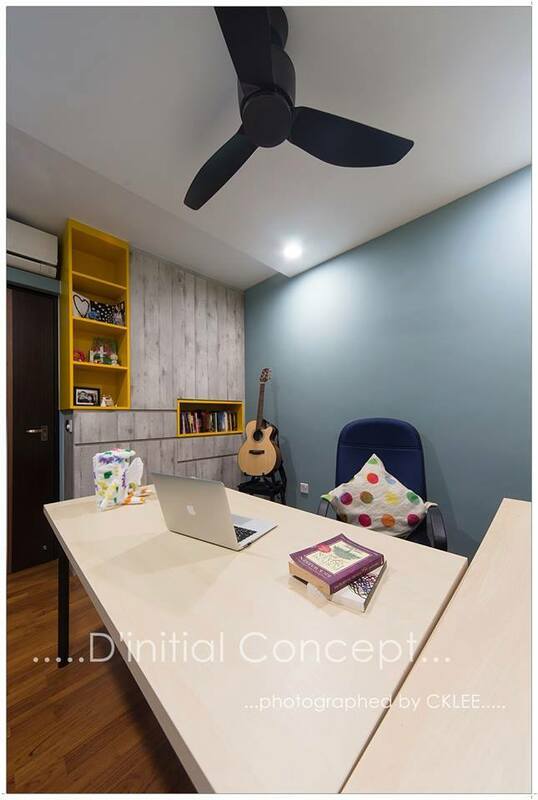 For the more casual music-lover, there's this room which combines work with fun. Whether you're a student deep in study or an employee who telecommutes, any time boredom or restlessness sets in you can just turn around, grab that guitar, and start jamming! Some collect instruments and records as a hobby; others make it their life's work. 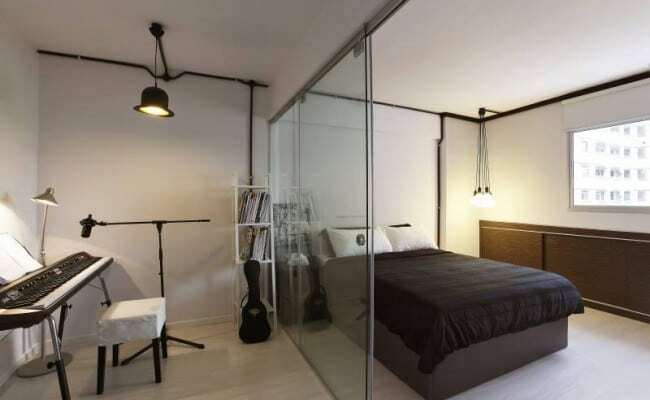 This bedroom/music studio shows off the owner's love of music. 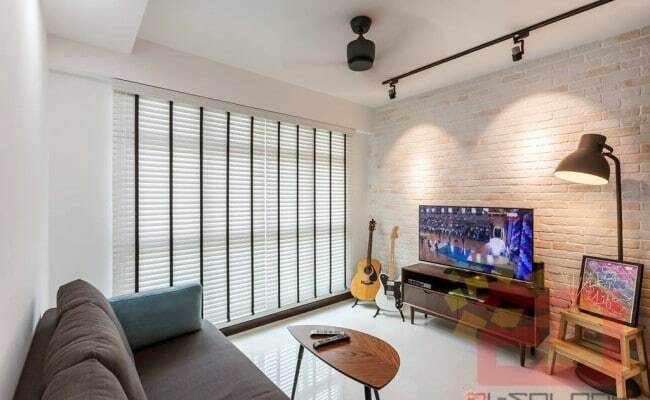 There's almost zero separation between the two spaces, and what little there is (by way of the sliding door) is transparent, thus giving an unobstructed view of the adjoining section. With strong lighting, a shelf containing albums, a large keyboard, and even a violin case, this is the home of someone who lives and breathes music. It's there from the moment this person wakes up to the moment he or she goes to sleep. If these seven examples have taught us anything it's that you don't have to be a musician to collect instruments or records. They can make wonderful additions to your home simply by being present, as part of the decor or as a pleasant distraction during work or study. But if you're truly devoted, then there are plenty of opportunities to show off your love of music in both large ways and small.